PRESIDENT ROBERT MUGABE arrived home to Zimbabwe from Asia this morning as his party denied reports he had suffered a health emergency. 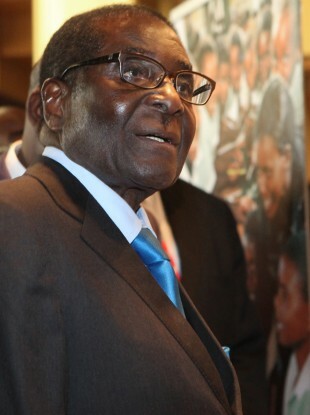 Mugabe, 88, was met at the main Harare airport by party leaders and military chiefs under normal protocol. He did not speak to waiting reporters. Mugabe’s party dismissed reports that he had been gravely ill as “a lot of hogwash” by hostile Western media organisations. He is scheduled to chair a ministerial meeting later today, two days later than first scheduled, the party said. Mugabe has made ten trips to Singapore in the past 16 months, reportedly for medical treatment. Said to be under treatment for prostate cancer, has called for elections this year and has been nominated as his party’s only presidential candidate. This time around, Mugabe left Harare on March 31 to supervise post graduate studies for his daughter Bona, 22, in Hong Kong, his office said. Intense speculation on his health came after a popular Nigerian preacher claimed to prophesy the imminent deaths of elderly, autocratic southern African rulers. Malawi’s 78-year-old president then died on April 5. As you can see, the man is fit … Why do we lie and why do we panic? Mugabe landed in a private jet chartered by a diamond mining company. The state airline he routinely used was grounded by debts in January. Reporters said his arrival was brisk and businesslike. Mugabe held the hand of his wife Grace and was dressed as usual in an impeccable dark business suit. Mugabe has appeared robust at recent public appearances. In broadcasts marking his 88th birthday in February he said he was “as fit as a fiddle.” He joked then he had been resurrected more often than Jesus Christ after detractors frequently pronounced him dead. In the broadcasts, he also acknowledged he had not groomed a successor in his fractious ZANU PF party, a shaky coalition with former opposition leader Prime Minister Morgan Tsvangrai formed by regional mediators after violent, disputed elections in 2008. Persistent reports of his failing health have intensified in-fighting in the party between factions led by Vie President Joice Mujuru and Defense Minister Emmerson Mnangagwa. Mujuru’s group has been weakened by the death of her husband, a former guerrilla leader and army commander seen as a major ZANU PF power broker. General Solomon Mujuru was burnt beyond recognition in a mysterious house fire last year and though questions remained over how he died a court ruled there was no foul play in his death. Mujuru’s family has demanded his remains are exhumed from a national shrine for independent forensic analysis. Mugabe led the nation to independence from Britain in 1980. Critics blame his policies for an economic meltdown in Zimbabwe and an upsurge in political violence, intimidation and human rights abuses over the past decade. Read: Is Robert Mugabe fighting for his life? Email “Mugabe arrives home - reports of illness "hogwash"”. Feedback on “Mugabe arrives home - reports of illness "hogwash"”.